"Green" is an adjective used to describe not only color, but also describes a commitment to environmental protection and sustainability. Municipalities are promoting their green qualities as reflected by their land use policies and zoning ordinances, which express their environmental, economic and social sustainability. 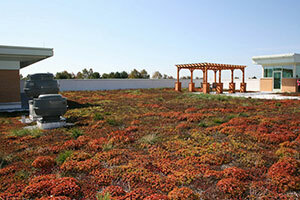 Municipalities are encouraging sustainable land use policies, energy-efficient construction techniques and innovative stormwater management techniques such as vegetated roofs and rain gardens. This tool discusses some of the actions that local municipalities can take to encourage sustainable or green land use policies and land developments, promote energy efficient construction and building techniques, and encourage environmentally-sustainable stormwater management practices. 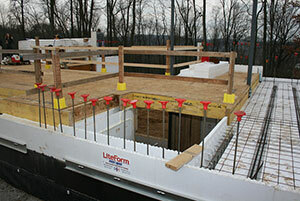 This foundation uses insulated concrete forms, which will be continued into the walls. This system is well insulated, and it's thermal mass (concrete) will substantially reduce heating and cooling costs. Energy Conservation: The use of green construction practices and techniques can reduce the long-term use of energy and can relieve pressure on municipal budgets. Encourages Market Acceptance: The use of green and sustainable construction practices and materials by municipalities can encourage their use in the private sector and can help increase their market acceptance. Lowers Pollution: Sustainable construction practices can reduce air pollution and improve indoor air quality. Environmental Protection: Green land use policies can help protect sensitive environmental areas through their preservation and by removing pollutants. Perception of High Price: Some green products and practices have higher initial costs, but these costs are generally offset by lower long-term operating expenses. Lack of Expertise: Green construction practices can require additional skills and knowledge. Regulatory Inflexibility: Building codes are established at the state level, and local municipalities have very limited abilities to require specific green construction practices and techniques. Municipalities have the ability to influence the land use patterns within their jurisdictions, which directly relate to environmental, social and economic sustainability. Local governments can encourage the use of sustainable developments, green construction practices and techniques by reducing the barriers to their widespread use. 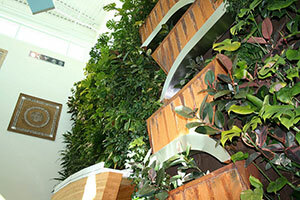 This "living wall" uses specialized plants to filter indoor pollutants from the atmosphere and improves the air quaility in the building. Use land efficiently (i.e., suburban sprawl is avoided). Optimize the use of public transit. Coordinate transportation modes and facilities. Municipalities should also review the other related Tools. 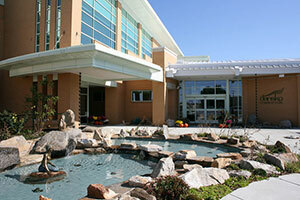 This building integrates its stormwater management system with attractive water features on the site. Floodplain management and protection practices. Municipalities can also encourage builders to design to the highest practical LEED certification. LEED-certified buildings are designed to reduce operating costs and increase a building's value, reduce landfill waste, conserve energy and water, be healthier and safer for their occupants, and reduce pollution. While municipalities cannot mandate the achievement of a particular LEED certification because verification often occurs after construction is complete (especially for the measurement of actual energy usage), incentives such as increased floor area or building height can be offered if the LEED point system is followed. The Pennsylvania Uniform Construction Code does not currently require LEED certification, but municipalities can still encourage its use through incentives, such as by allowing additional development density or by discounting part of the application fee for building permits. Municipalities can encourage specific design practices such as vegetated roofs and rain gardens. This vegetated roof is accessible to the building's users. Vegetated Roofs: Vegetated roofs (also known as green roofs, living roofs or eco-roofs) are roof surfaces that typically consist of waterproofing and drainage materials and engineered growing media that support plant growth. Vegetated roofs capture and temporarily store stormwater runoff in the growing media before it is conveyed into the stormwater drainage system. A portion of the captured stormwater evaporates or is taken up by plants, which helps reduce peak runoff volumes, runoff rates, and pollutants. These planting areas can reduce the thermal load under the roof, the "heat island" effect can be reduced, and these roofs can help protect the underlying roof membranes from ultraviolet radiation and puncture damage. Municipalities can encourage the use of vegetated roofs by allowing them to meet open space area requirements, especially if they are accessible to people who use the site. Rain Gardens: A rain garden is a planted shallow depression that is placed near an impervious stormwater runoff source such as a roof, parking lot, walkway, compacted lawn area or driveway and is designed to capture stormwater runoff and prevent it from reaching the sewer system. Transpiration by growing plants accelerates soil drying between rain events. Native plants take up the stormwater, or it is filtered through soil layers before it reaches the groundwater level. A rain garden can also capture stormwater runoff that may contain pollutants such as hydrocarbons and excess nutrients that may otherwise contaminate waterways. Pervious paving is sometimes used in conjunction with rain gardens. Rain gardens also create habitats for birds and beneficial insects and add aesthetic appeal to multi-family, commercial and industrial developments. Municipalities can encourage the use of rain gardens through incentives such as by allowing them to meet open space area requirements, by including them within required landscaping areas, or by allowing them within recreational areas. Some municipalities encourage rain gardens by reducing the required amount of landscaping that would otherwise be required. The Borough of West Chester Zoning Ordinance includes two Height Option Overlay Districts that permit taller buildings to be constructed if they are designed to the U.S. Environmental Protection Agency's Energy Star rating, or if the building achieves a rating of "LEED-NC certified" or higher. The Borough's Zoning Ordinance is available at the Borough Hall. The Smart Communities Network helps communities design and implement innovative strategies that enhance the local economy as well as the local environment and quality of life. Its website contains a "tool kit" of sustainable information including manuals, workbooks, bibliographies, data bases, case studies, and model codes and ordinances.